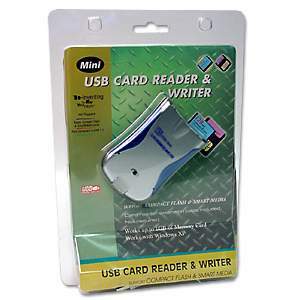 Card reader/writer offers a simple solution to reading or writing to CompactFlash and SmartMedia cards - simply plug this reader into your computers USB port. 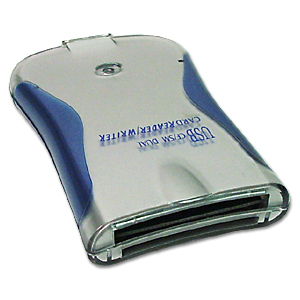 Used for Digital Cameras, MP3 Players or anything else that uses a CompactFlash or SmartMedia Memory cards. Package says Work up to 1GB. I tested with 4GB Compact Flash Works Perfect. Update 04/19/2012: I could not find a OEM Manufacture on this Product. I have Tested in on Windows VISTA Works Great with Microsofts Default Storage Driver Which Loads Automatically.